Probably almost everyone is familiar with the hyperinflationary episode that engulfed Germany after the First World War. That nation’s economy was crippled by monetary problems that resulted in dreadful personal hardships, even though up to that time Germany had achieved one of the highest living standards in the world. The newly formed German government, named for the city where their constitution was drafted after the Kaiser’s abdication in 1918, kept pumping up the money supply. The process started relatively slowly, but quickly the pace of money creation accelerated. The Weimar government was paying its bills on credit – just like Zimbabwe is now doing. The Weimar government was issuing currency in exchange for valuable goods and services that it was receiving, and the vendors of those goods and services accepted the newly issued currency in the expectation that they would be able to exchange it for goods and services of like value. However, they soon realized that they were deluding themselves. Prices were rising rapidly, with the consequence that a flight from the currency into commodities and other tangibles began. There was no discipline on the creation of new currency, with the result that it was being issued to excess. Within a few short years, the German government eventually destroyed the Reichsmark, the currency it had been issuing, making the words Weimar Germany synonymous with hyperinflation, economic collapse, deprivation and personal hardship. All the wealth saved in Reichsmarks was wiped out. 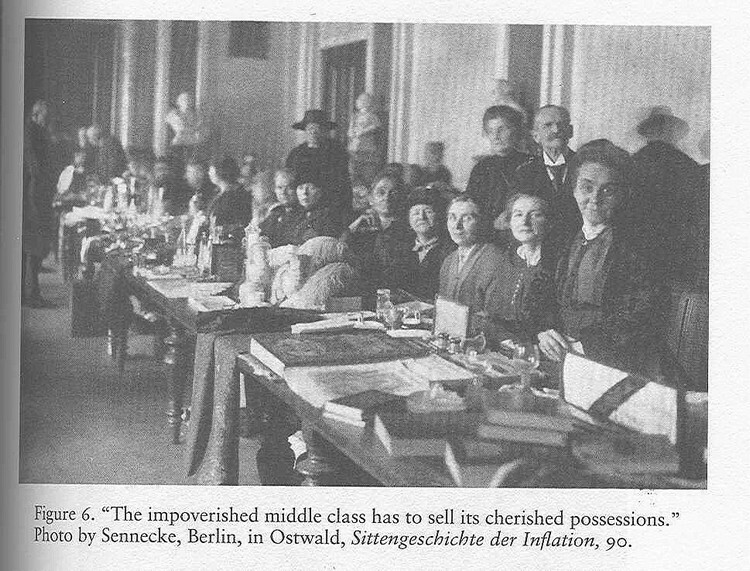 The following photo is from an insightful book by Bernd Widdig entitled “Culture and Inflation in Weimar Germany”. This photo shows one way in which people coped with rising prices. As the inflation worsened, people sold whatever they could to survive. Widdig succinctly describes it in the caption to the above photo as follows: “The impoverished middle class has to sell its cherished possessions.”He should have correctly stated though that it was the “newly impoverished middle class”. They only became destitute after the inflation had destroyed their savings and ability to maintain their standard of living. AP explains how some Americans are trying to cope with the ravages of inflation: “To meet higher gas, food and prescription drug bills, they are selling off grandmother’s dishes and their own belongings. Some of the household purging has been extremely painful – families forced to part with heirlooms.” It is indeed no doubt painful, just as it was for the Germans in the photograph above, who surely must have been putting on a brave face for the photographer. Crude oil is $132. Corn is $6.The cost of everything is rising. Inflation is worsening, and it’s not hard to understand why. M3, the total quantity of dollars, is now growing by 17% per annum. Weimar inflation has arrived in America. The Federal Reserve is following the footsteps of the central bank in Weimar Germany. It is the same path taken by many central banks that have issued countless fiat currencies based on nothing but government promises. It is the path to the fiat currency graveyard, and the once almighty US dollar – which long ago used to be “as good as gold”, just like the Reichsmark once held that same exalted title – is knocking at the graveyard’s gate. Absent that compulsion, the dollar is going the way of the Reichsmark. Don’t count on the US government to do the right thing and make the dollar redeemable into gold. Instead, take those steps necessary to protect yourself and your family to prepare for the dollar’s inflationary collapse. Buy gold. Buy silver. Avoid the US dollar. James Turk is the Founder & Chairman of GoldMoney.com <http://goldmoney.com/>. He is the co-author of The Coming Collapse of the Dollar, which has been updated for a newly released paperback version, now entitled The Collapse of the Dollar <www.dollarcollapse.com>.